When the fall of the year arrives with cooler temperatures, the leaves put on a dazzling display of colors and dancing. The sun hangs a little lower in the sky, throwing warm afternoon light across anything it touches. Some of the most beautiful light of the year happens late October to early December, making it a great time for afternoon or morning sessions. 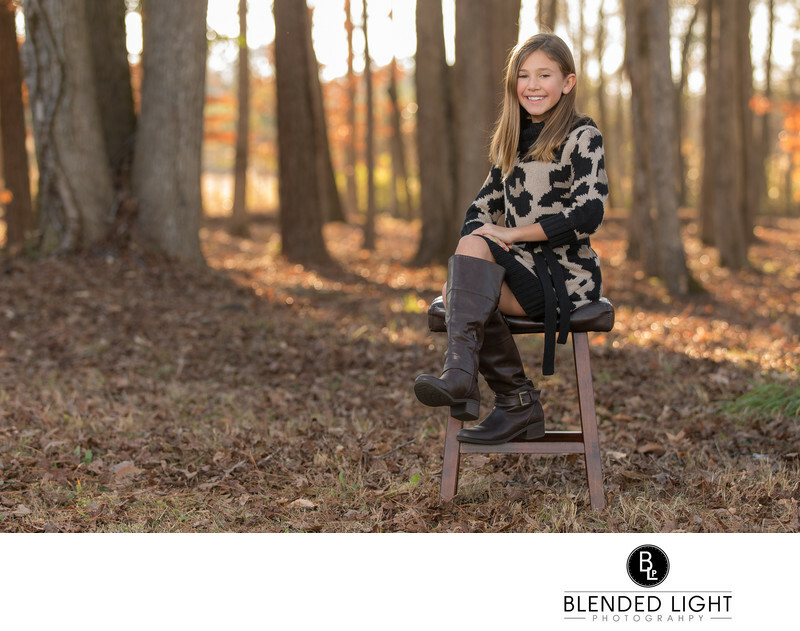 With fall sessions, location is key as you want to capture the warmth of the season in your images. This picture is from a late afternoon session in early December. Most of the leaves had fallen off the trees by this point, covering the ground in subtle brown tones. As the sunset behind the trees, the glowing light turned the ground into a blend of shadows and fall colors. The sunsetting just behind her provided just the right amount of warmth to give context to the time of year. We sat this young lady on the stool and just let her be her. Other the directive of "Sit up straight!" from mom, it's all her. She was completely in shade, so to keep details in the brighter background, I used the sun to put a touch of glow to her hair and then used an off camera flash in front of her and to the left provide the light on her, blending the light from the flash and background sunlight nicely. 1/80; f/3.2; ISO 50; 100.0 mm.